An American hero has died … Armstrong captured the imagination of a generation and inspired many to follow their dreams and reach for the stars. 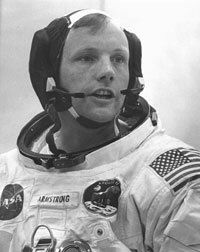 Neil Armstrong, the first man to step foot on the moon has passed away at the age of 82 in Cincinnati, Ohio. His family Announced the death at 2:45 pm ET. A statement said he died following complications resulting from cardiovascular procedures. Armstrong underwent a heart-bypass surgery earlier this month to relieve blocked coronary arteries. Armstrong, the private hero, kept to himself and was a very private individual. Neil Alden Armstrong was 38 years old at the time and even though he had fulfilled one of mankind’s quests that had loomed for centuries and placed him at the pinnacle of human achievement, he did not revel in his accomplishment. He even seemed frustrated by the acclaim it brought. Armstrong grew up in Ohio with a strong interest in flight and earned his pilot’s license while still a boy. After flying combat missions during the Korean War, he became a test pilot and joined NASA’s astronaut program in 1962. Armstrong’s pulse was measured at 150 beats per minute as he guided the lunar lander to the moon’s surface, NASA said. To a true American hero, Rest in Peace.